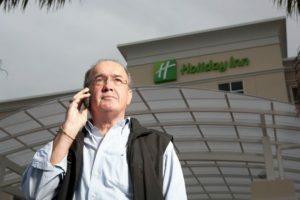 Fred Hirschovits hopes companies cutting back their travel budgets will choose his Holiday Inn hotel instead of a more expensive resort. Is this any time to be opening a new hotel? Fred Hirschovits concedes his timing is off as he prepares to open a 170-room Holiday Inn hotel near Interstate 75 in Estero. “Obviously, when we started [three years ago] we didn’t know what today would bring,” says Hirschovits, president of the Naples-based hotel development and management firm called Twenty/Twenty Worldwide Hospitality. “We just have to survive the next year and a half,” he says. Revenue per available room, an important financial gauge that combines occupancy and rate, fell nearly 12% in November in the Fort Myers area compared with the same month a year ago, according to the latest data from Smith Travel Research. But, Hirschovits says, “the AIG effect is positive for us.” He’s referring to the giant insurance company that was widely criticized for holding lavish conferences and parties at posh resorts while accepting taxpayer money as part of the financial bailout. Road than the Ritz in Naples or the Hyatt in Bonita Springs. But so is everybody else in the neighborhood. Hoteliers have been building more than 600 new mid-priced hotel rooms near the Holiday Inn because of the proximity to I-75, Southwest Florida International Airport, Florida Gulf Coast University, Germain Arena and perhaps a new stadium for the Boston Red Sox baseball team. All these hotels were planned in 2004 and 2005, when the area in south Lee County was booming. In that time, developers built two new malls totaling nearly 56 football fields of shopping space, the new airport terminal opened and 7.6 million passengers passed through it last year and the university grew to 10,000 students in 2008. But because of the corporate downturn, travel budgets have been slashed. That’s going to be a challenge for Hirschovits, who expects at least half his rooms to be filled with corporate customers. “Are we going to have a bumpy ’09 and tough ’10? Yes,” says the Finland-born entrepreneur. However, Hirschovits added some touches to his Holiday Inn that should make it an attractive alternative to higher-priced hotels in the region. For starters, the hotel has 7,000 square feet of meeting space, twice the usual amount for a typical Holiday Inn. And its 170 rooms exceed the usual 130 rooms for the chain. He declines to say how much he and undisclosed partners have spent to build the hotel. The Holiday Inn also is a full-service hotel that includes a restaurant and pool overlooking a lake. Hirschovits hired Brian Holly, the former general manager of the upscale Sanibel Harbour Resort & Spa to run the place. When guests enter the hotel, a hidden machine blows a fresh smell into the lobby and they can check in at kiosks instead of standing in line at a reception desk. Each room has a full-size desk for work, surge-protected outlets, wired and wireless Internet access and hand-held showers in the bathrooms. One thing Hirschovits isn’t planning on doing is lowering his rates. When the economy slows, he says hoteliers panic and automatically slash their rates. “They’re leaving money on the table,” says the 1975 graduate of the Cornell University School of Hotel Administration. Hirschovits says hoteliers in the Estero and Bonita Springs areas should get together to lure larger groups that could fill multiple hotels. With the likely prospect of a Red Sox spring training stadium opening in 2012 and pressure on the university to start a football program, it would benefit the hoteliers to market jointly. “Let’s get some good, big business,” he says.